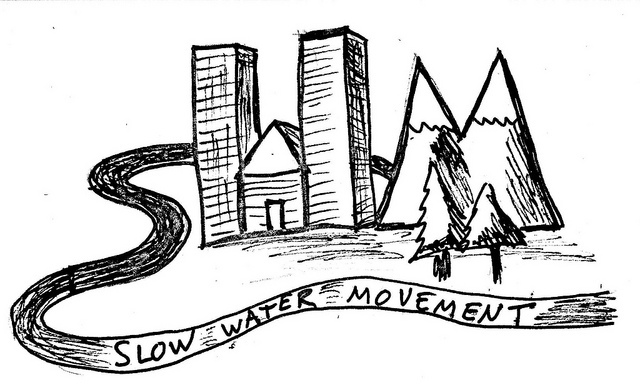 The "Slow Water" Movement: Will the Next Nocturnal Rain Awaken Vermont's Amphibians? Most of Vermont's amphibians breed and lay eggs in wetlands or vernal pools, but they can't overwinter in these places - when the saturated soil freezes and experiences 'frost heaves' it could easily kill them. Instead, they 'overwinter' in drier upland areas. Once the spring thaw comes, they must migrate back to their breeding areas. Since vernal pools by definition usually dry up in the summer, there is limited time for amphibians in these areas to complete their life cycle. Above: Vernal pools like this one (seen last year near East Middlebury) offer essential spawning habitat for Vermont's amphibians. Because last year was so snowy and the spring so cold, the amphibian migration was later than usual - in early to mid April. Luckily, the wet conditions of last spring offered plenty of water in the vernal pools. This winter has been much milder and drier than last winter, so the amphibians need to come out as soon as they can. Although warm weather is forecast for this week, there isn't much rain in the forecast, and what is forecast will probably fall tomorrow during the daytime. Unless the rain starts earlier or extends later than forecast, the amphibians may not start 'move' this week. If not, the next nighttime rain (which will probably come next week) should bring them out in droves. Amphibians probably arrived in Vermont shortly after the glaciers melted at the end of the Ice Age (and undoubtedly were around before and between other ice ages as well), and they have been migrating every spring since that time. There have been some very significant changes in the last few hundred years that pose new challenges to these small Vermont residents. One of the most significant of these is the construction and use of our large road network. Unfortunately, many amphibians are killed every year when they have to cross roads to reach their spawning areas. Luckily, people have noticed, and there are efforts each year to monitor the crossings and help the amphibians on their way. If you live in northern New England, ask your local conservation organizations if they need help - you will experience a truly cold night in the rain, but will be rewarded by a unique encounter with some of the region's most ancient (and cutest!) residents. This is also likely the only time you will ever see a spring peeper - these loud but reclusive frogs are almost impossible to find once they make their way to wetlands and begin calling. Usually it is best to avoid touching wildlife, but in this case you will be encouraged to pick up and move the amphibians out of harm's way. If you live in warmer climates, your amphibian migration may have already occurred (a friend told me she already heard the peepers calling around Pittsburgh) so you may have to wait until next year. 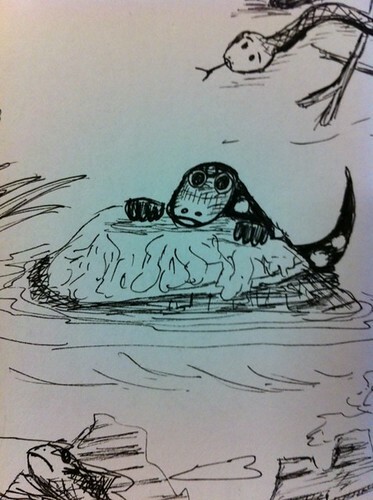 Above: the spring amphibian migration can be dangerous for these tiny creatures, and this is a silly doodle I made of a spotted salamander peeking out from behind a rock. Unlike snakes, which are often falsely accused of being 'slimy', amphibians definitely fit that bill, but don't let that deter you! Amphibian slime helps keep them moist and often contains toxins to deter predators, but I don't think you will be tempted to eat any of them anyway. Over the next few weeks, it's also not a bad idea to avoid driving near wetlands or woods during nighttime rains. If you do need to traverse these areas by vehicle, consider slowing down so you can safely dodge any amphibians crossing the road. If preserving Vermont's biodiversity isn't reason enough for you, consider that most amphibians eat large quantities of insects - the little frog you drive around could mean less mosquito bites this summer - something anyone will agree is a good thing.